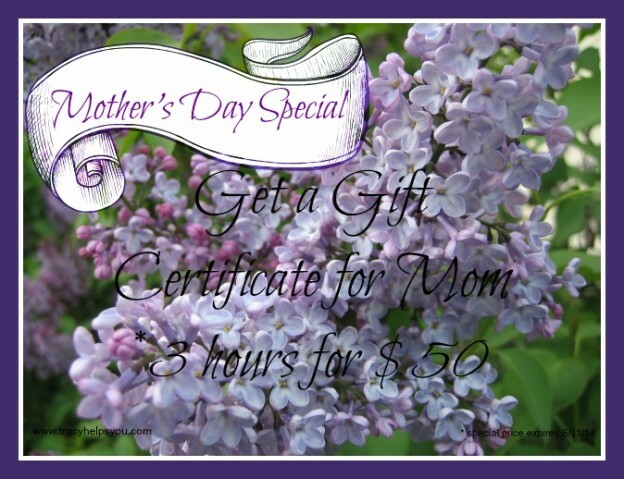 It’s May in Chicagoland, to me, that means lilacs (my fav) ~ May also means Mother’s Day to us Americans. On Mother’s Day, we honor our mothers with gifts and cards. Flowers seem to be a particularly popular gift. Many families treat Mom like a queen on Mother’s Day … treating her to breakfast in bed and a day of relaxation by taking over her usual household duties for the day. Many families go out to share a meal together. Everyone needs some free time / me time, especially Mothers. Sometimes, Moms can feel a little guilty about taking some time for themselves in their busy life. There is always so much to get done. While I am taking care of her To-Do List, she can be relaxing without worrying about things not getting done. While you are making your Mother’s Day plans and choosing the perfect gift for her ~ remember that your Mom deserves to be pampered & treated far more often than just on the holidays. While you are with her this weekend, helping her out with some of those chores around her house, give her a Tracy Helps You gift certificate. It’s like giving her the gift of free time. This entry was posted in My Thoughts & Opinions, Personal Assistant, Seasonal and tagged Family, Free Time, gift certificate, Gifts, Give the Gift of Time, Holiday, Mother's Day, To Do List, Tracy Helps You on May 11, 2017 by Tracy.